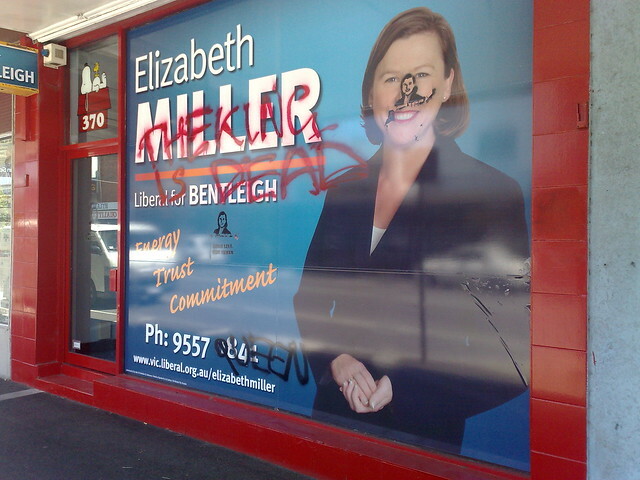 The electorate office of new member for Bentleigh, Elizabeth Miller, has been vandalised. The stencil, which reads “Long live the queen” with an image of Miller, appears to indicate some preparation was involved. Given the “The king is dead, long live the queen”, I can’t work out if this is pro-Miller, or pro-ex-member Hudson, or both, or neither. Update: It turns out Miller has taken over Hudson’s old electorate office, making the vandalised shopfront just a (temporary, one would assume) campaign office. It would seem a strange process to show your support by vandalising someone’s office. It’s a bit over-the-top. A Hitler mustache would have been much nicer. Ours tend to confine themselves to buying tea towels and mugs…….